And thus, a great soul departed leaving his old father, two brothers, four sisters, a daughter, two grand daughters and many relatives behind. All were present there to offer their last prayers. He was so beloved. Maharaj K. Kaul, born on Nov. 11, 1940 in Srinagar, Kashmir, was the second son of Kashi Nath Kaul, a civil servant the in Kashmir State Government, and Shobha Devi. After getting his engineering degree from Patiala, Punjab, he got his Ph.D. in civil engineering from the University of California, Berkeley in 1972. Till his death he was working with G.E in their research wing. He authored several research papers and he was well known in his field. But Maharaj’s passion was the work he did promoting social justice, economic equality and freedom for masses. Ever since his university days, when he was active in India Forum, he relentlessly worked for his passion. 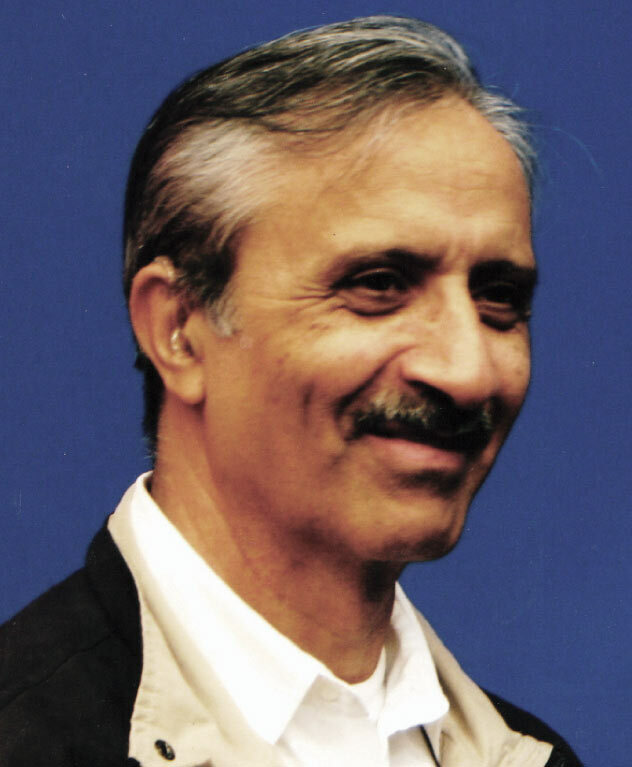 He was the founding member of many organizations, such as South Asians for Collective Action, Coalition against Communalism, Pakistan - India –Friendship Society, Gadar Heritage Foundation and the founding director of India Relief and Education Fund He had organized dozens of film screenings of progressive Indian films, plays and other events to promote the causes close to his heart. He never sought fame or credit for his tireless work. And his mother fondly told us many times he was a gentlest saintly son and friend. Indeed he devoted so much time to solve problems of his friends. He was total giver. We can not put in words what we lost in his demise. We send our deepest condolences to his bereaved family, particularly his father and beloved daughter Aparna and her two lovely daughters. Poet folklorist Ved Prakash Vatuk’s many awards include the U.P. government’s Pravasi Bharatiya Hindi Sahitya Bhushan. “Essays in Indian Folk Traditions,” his collected writings, has just been published by the Folklore Institute, Berkeley, Calif.
“Victory and a New Resolve for Justice” Rally to be held as scheduled on Sunday March 20th 4:30 PM Outside the Madison Square garden. Mr. Modi is directly implicated in the 2002 massacre in Gujarat, India, of more than 2,000 persons and is a member of a violent and chauvinistic Hindu nationalist organization called the Rashtriya Swayamsevak Sangh (RSS – National Volunteers Corps). The RSS is a shadowy all-male organization drawing inspiration from Hitler and Mussolini that trains militia-like groups of men and indoctrinates them into ideologies of racial/religious cleansing. Mr. Modi currently faces two law suits for crimes against humanity in India, and is in violation of international laws and conventions including Convention on the Elimination of all forms of Discrimination Against Women, and the International Religious Freedom Act of 1998. The Coalition Against Genocide (CAG) campaign focus was to educate and inform the American public and policymakers about Mr. Narendra Modi’s role in the 2002 Gujarat pogrom and in preventing justice being delivered to the victims of the pogroms. Although Mr. Modi is attempting to characterize the state department’s visa denial as a nationalist issue, we would like to point out that he was not here to represent the Indian state. Instead, he was sponsored by a corporate entity, the Asian American Hotel Owners Association (AAHOA), that condoned his abysmal human rights record and invited him as chief guest for their annual convention in Fort Lauderdale, Florida on March 24, 2005. CAG’s publicity and outreach actions included letters to Secretary of State Condoleezza Rice, a campaign to inform members of the U.S. Congress, and a phone and fax campaign against MSNBC host Chris Matthews, American Express and the California State University, Long Beach, who were sponsoring and participating in Mr. Modi legitimation process during his U.S. visit. CAG’s first success came when Chris Matthews withdrew from the AAHOA convention. Further, the CAG campaign moved Rep. Conyers to introduce Resolution 156 in Congress condemning Mr. Modi and finally led to the denial/revocation of the visas by the State department. Responding to the announcement of visa denial, CAG spokesperson Usha Zacharias said the visa denial decision “is a testimony to the work done by large segments of the progressive organizations in India and abroad who documented in great detail the abuses of Mr. Modi. 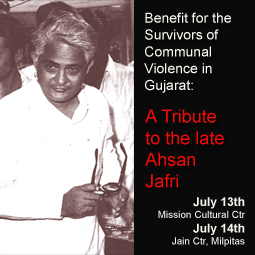 CAG’s work in the U.S .was to use this detailed documentation and highlight the desperate need for justice to the victims of the pogrom in Gujarat.”CAG will continue with its plans to hold a rally on Sunday March 20th at 4:30 PM outside the Madison Square Garden where Mr. Modi was to speak, except that it will be a “VICTORY AND A NEW RESOLVE FOR JUSTICE” rally instead of a protest. The Sunday rally will highlight the continuing human rights violations in Gujarat and push further for the speedy delivery of justice to the victims of the 2002 pogrom. 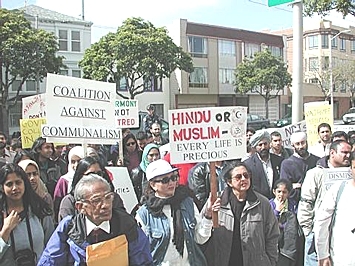 In addition the rally will challenge the role of the US supporters of the divisive politics espoused by Mr. Modi and his political party, and their attempts to direct money to institutions in India that promote hate-mongering and communal violence. CAG considers the denial of visa to Mr. Modi as a clear victory for supporters of human rights and justice in the U.S. and in India. It sends a clear message that perpetrators of religious and political persecution can be held accountable for their actions through dedicated work by broad, inclusive coalitions. Indian and U.S. groups share a long, common tradition of battling for human rights, and securing justice for the oppressed that CAG and its partners will continue to build on. In this context, we call on the Indian government to legally follow up this decision by pressing criminal charges against Modi, and by choking the funding pipeline that runs from the U.S. to India to facilitate the growth of Hindutva’s violent politics.We also call on all organizations concerned with minority rights and women’s rights to join us in our battle against the RSS ideology of ethnic cleansing we witnessed in horrific detail in the 72-hour pogrom in Gujarat. Amnesty International has clearly held the state of Gujarat, headed by Mr. Modi, responsible for gender crimes in its report, Justice, the victim - Gujarat state fails to protect women from violence http://web.amnesty.org/library/index/engasa200012005, as has Human Rights Watch. The cancellation of Mr. Modi’s visit represents the first step in a battle we must continue to fight. We are a delegation of NRIs, representing various organizations from the U.S., who went to India on a non-partisan humanitarian mission, to see for ourselves the aftermath of the Gujarat carnage. We went there to listen, and to learn about what we can do to support initiatives for communal harmony. We met a wide cross section of civil society, including the victims of the unprecedented violence; NGOs who have been caring for them; and other citizen's groups, businessmen, religious leaders, politicians and the media. As ruling party officials in Gujarat and New Delhi declined to meet with us, we could only meet with the opposition parties. We conveyed to them our views on the desperate humanitarian situation in Gujarat, and challenged them on how they would rule differently should they return to power. We presented our observations and recommendations in a memorandum to the President of India, A.P.J. Abdul Kalam, at the Rashtrapathi Bhavan on September 12. We met the Chief Minister of Andhra Pradesh, Mr. Chandrababu Naidu, on September 23, and urged him to use his influence in New Delhi to bring some hope to those who are still being victimized in Gujarat.Most of us are now back in the U.S. to share our experiences with others; to raise awareness in the NRI community about the dangers of continued silence about the break-down of the rule of law in Gujarat; and to raise funds for the rehabilitation of the victims. Some of us plan to spend more time in India to pursue individual actions in support of communal harmony and/or to work against the politics of hate. We have prepared this write-up for our friends, and others who care about what is happening in India, to give them a sense of what we saw and heard. Our observations are based on notes and recollections by some of us, and do not necessarily represent the collective view of this diverse delegation. Where possible, we have included a Q & A format, representing the general thrust of our conversations with our hosts (not direct quotes). in the tragedy, and applaud the prompt action of the law enforcement authorities in bringing the situation under control. their duty to protect the lives of all its citizens. 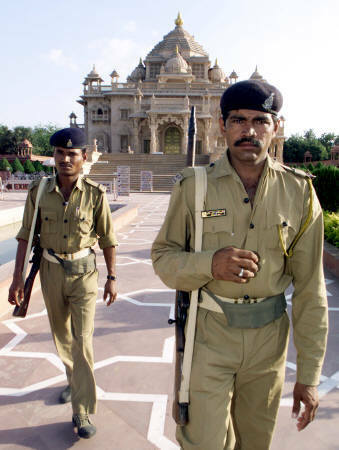 A recurrence of communal killings will not only be an insult to the victims at Akshardham, it would be a treasonous act that betrays India since it will fulfill the goals of the killers who attacked the temple. We also ask the State and Central government to ensure that the perpetrators of this terrorist acts, and their co-conspirators are brought to a speedy and fair trial, to rebuild faith in the States rule of law. The people of Gujarat must also act to preserve peace, their heritage, and their future. Gujarat cannot once again descend into a frenzy of hatred. CAC and EKTA would like to thank the many organizations who co-sponsored our two fundraising events- India Relief and Education Fund, Association for India's Development (Bay Area Chapter), Friends of South Asia, Global Exchange, Indian Muslim Relief Committee, Narika, South Asian Bar Association, 3rd I and Trikone- and the many dedicated volunteers, performers and donors who made our efforts a success! © 1992 - 2005 - Coalition Against Communalism. 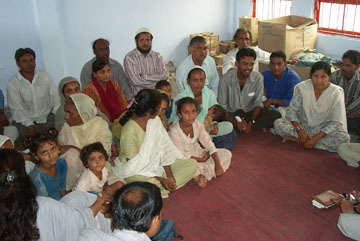 Site hosted by ektaonline.org.